This deliciously amusing play is a comedy. 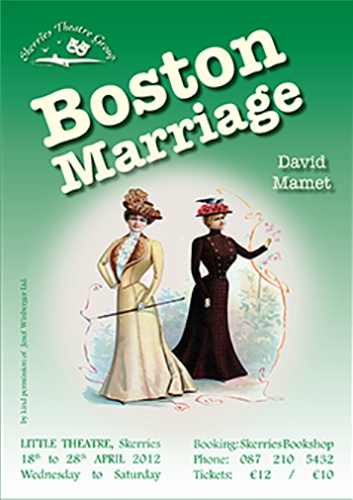 Set in New England in the United States during a time of puritan respectability c 1900, the play concerns two women Anna and Claire. We find ourselves in the residence of Anna (Mary O’Maolmhuire), a middle-aged, fashionable lady who engages in a High Society, portentous, literate babble laden with sarcasm. She is visited by her ‘old best friend’ Claire, (Nara Fritch) who has returned to her, after an indeterminate absence. Claire has come to tell her that she is ‘in love’. They engage in mischievously playful dialogue of poisonous verbal candy, repartee and one-upmanship. Catherine, the maid, (Ciara Leonard). Her relationship to the two ladies is inexplicable in this zany household. At first she appears to be meek and subservient and is verbally abused by both Anna and Claire, who call her variously Bridie, Mary, Peggy, Molly and Nora. However, she is inured to the abuse and by her cheeky retorts and ‘rapier wit’ makes it clear that she is in on the elaborate game. Mamet has been compared to Jean Genet (The Maids), Oscar Wilde, GB Shaw, Eugene Ionescu and Noel Coward. This is a play of wit and humour.